Approximately 40,000 years ago, Devonport was made up of three islands - Mt Cambria, Mt Victoria and North Head. Successive eruptions created the present shape of Devonport's peninsula. Maori arrived in approximately 1350 and landed at what is now called Torpedo Bay. They established pa (fortified villages) and gardens on the volcanic cones. Europeans began to arrive in the 1800s and Devonport was one of the first places to be settled in the Auckland region. It has since become one of the most vibrant marine suburbs and is the home to the Royal New Zealand Navy. The first ever ferry service, in 1860, carried 16 people to Auckland. These days, Fullers ferries make 31 sailings daily on the "Kea" and it takes just 12 minutes to reach Devonport from Downtown Auckland." Arriving at Devonport by ferry, one can feel and see the special atmosphere created by the village just beyond the wharf. 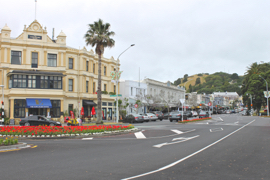 Devonport village is renowned for its diversity of restaurants, cafés and bars. Take time to check out the Art Deco Theatre and Naval Museum. "There is more to Devonport than the main street" locals would tell you. After your Explorer Tour, wander around the village to view the lovely cottages and bungalows built from New Zealand's native timber. In December, Devonports parks feature many pohutakawa (the New Zealand Christmas tree) which will be covered in vibrant red flowers. Maori named North Head "Takapuna" (falling spring) referring to the spring of water on the southern slopes. The mountain and its surrounds offered excellent soil quality for growing kumara (sweet potato), large tidal beaches to collect seafood, and good fishing. In 1790 opposing tribes surrounded North Head and decimated the local tribe. It was repopulated but, in 1793, was invaded once again and this proved to be the end of significant Maori settlement on North Head. 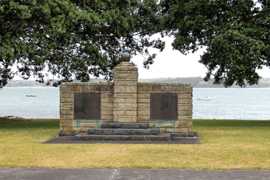 Direct European involvement with North Head began in 1836 when Captain D. Rough was appointed as the first pilot and harbour master for Auckland. In 1850, a small gun was sited on top of the hill which fired to announce to the arrival of mail ships. In the 1870s the growing Russian fleet in the North Pacific led to fears of an invasion. 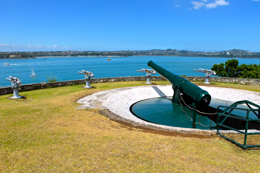 The fortification of North Head began in 1875 and by 1889 North Head's Fort Cautley was well established with new guns and an 8-inch disappearing gun. During the 1890's Fort Cautley was completed with tunnels, underground storerooms, barracks, kitchens and searchlight emplacements. When the Russian invasion did not eventuate, it was decided to dismantle the guns. The government decided in 1933 to re-arm North Head. When Japan entered WWII in 1941, the defences were scaled up. 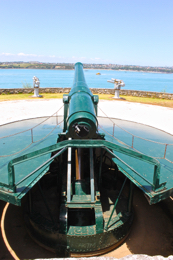 However, the only shots fired from North Head were for practice or as salutes. At the end of the war North Head became a park and is now run by the Department of Conservation as a historic reserve. The tunnels today are worth a good look around, especially the disappearing gun. 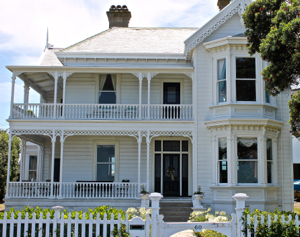 Devonport features many examples of period architecture. The beautifully restored homes, some built 150 years ago, include styles such as Victorian, Colonial, Georgian, Bungalows and huge Villas. The main street also features the Esplanade Hotel, first built in 1864 as the "Flagstaff Hotel" then rebuilt and renamed in 1902.